Everett Road Covered Bridge is one of the only remaining covered bridges in Summit County. However in the 19th century, it was one of over 2,000 in Ohio. 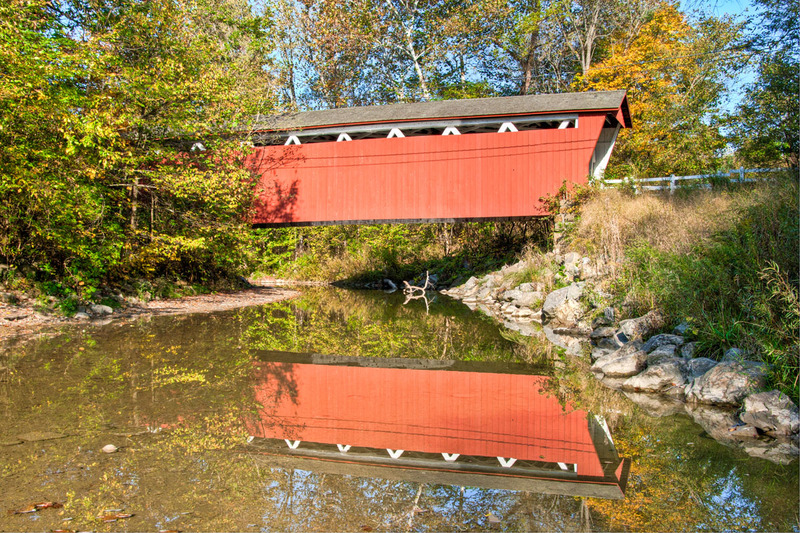 The builders of Everett Road Covered Bridge used a truss pattern patented by Robert W. Smith of Tipp City, Ohio, in 1867. The bridge was also unlikely to have been built much after the 1870s. 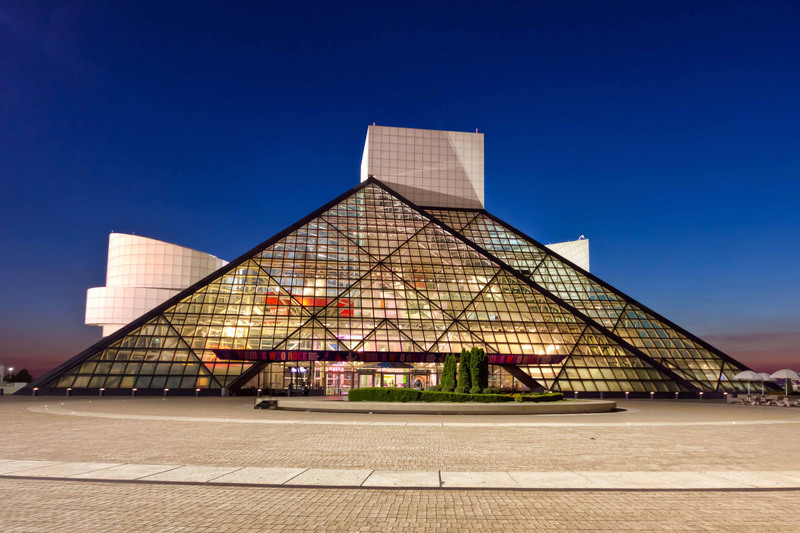 The 2012 Rock Hall induction is in Cleveland! Guns N’ Roses, the Beastie Boys and the Red Hot Chili Peppers; how cool would it be to be there for this? From Cleveland.com: “The 2012 induction ceremony will take place Saturday, April 14, at Public Auditorium in Cleveland. Guns N’ Roses, the Beastie Boys, Red Hot Chili Peppers, Donovan, Laura Nyro and the Small Faces/Faces will be inducted as performers. Late bluesman Freddie King will be ushered in as an early influence. Among the nonperformer inductees will be Don Kirshner, Tom Dowd, Glyn Johns and Cosimo Matassa. The inductions here will be preceded by nine days of tie-in events, including the grand opening of the Rock Hall’s library and archives on Cuyahoga Community College’s Metropolitan Campus, the launch of a major new exhibition and a free “Concert for Cleveland.” Details for those events will be announced later, along with celebrity presenters for the inductions. 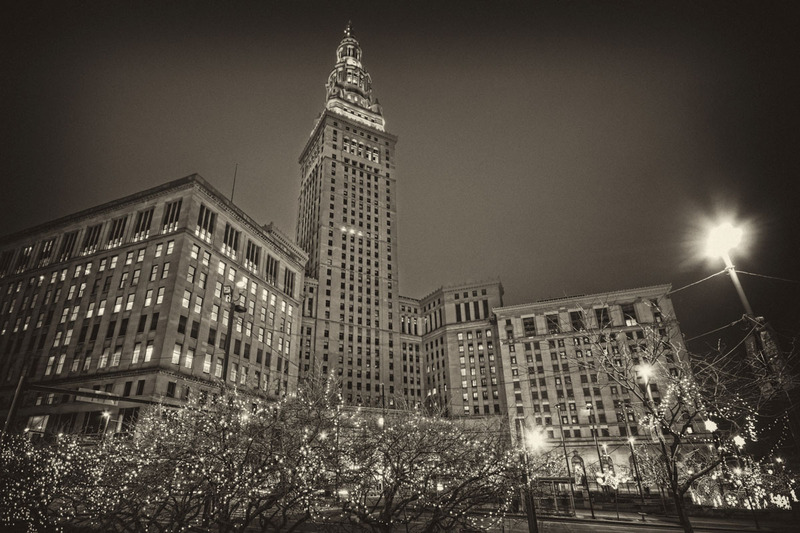 The Terminal Tower is located on Public Square and is Cleveland’s signature landmark. It was the second-tallest building in the world when it was completed. The Terminal Tower stood as the tallest building in North America outside of New York City from its completion in 1930 until 1964. Welcome to the Ohio Theater! Today’s Photo: Welcome to the Ohio Theater! “The Ohio Theatre is a theater on Euclid Avenue in downtown Cleveland, Ohio, part of Playhouse Square. The theater was built by Marcus Loew’s Loew’s Ohio Theatres company. It was designed by Thomas W. Lamb in the Italian Renaissance style, and was intended to present legitimate plays. The theater opened on February 14, 1921, with 1,338 seats. The foyer featured three murals depicting the story of Venus, and the balcony contained paintings of Arcadia. Throughout the 1920s, the Ohio had a stock company and hosted traveling Broadway plays. In 1935, the theater was redecorated in an Art Deco style and transformed into a supper club called the Mayfair Casino. The owners hoped to turn the establishment into an actual casino, but since gambling was not allowed in Ohio, the Mayfair closed in 1936. The Loew’s Theatres chain (then the parent of Metro-Goldwyn-Mayer) acquired the building, and in 1943 the Ohio reopened as a movie theater. A 1964 lobby fire damaged the interior, which was painted red to hide the smoke damage. Decreasing patronage caused the theater to close in early February 1969, along with the rest of the Playhouse Square theaters. Twice the Ohio and State Theatres were threatened with razing in order to build a parking lot; in 1972, when the buildings were saved by public outcry, and again in 1977. The Playhouse Square Foundation responded by obtaining a long-term lease for the theaters, and the Loew’s Building was purchased by Cuyahoga County. 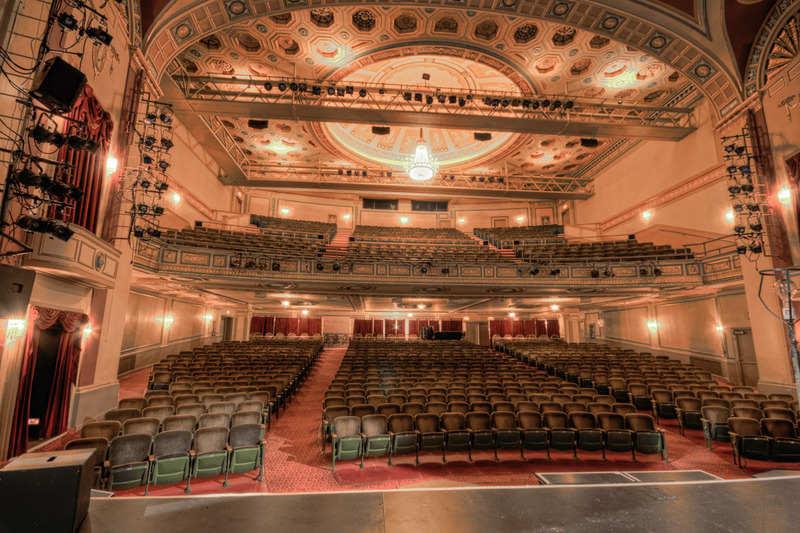 In 1978, the Ohio was added to the National Register of Historic Places, along with the rest of the Playhouse Square group. 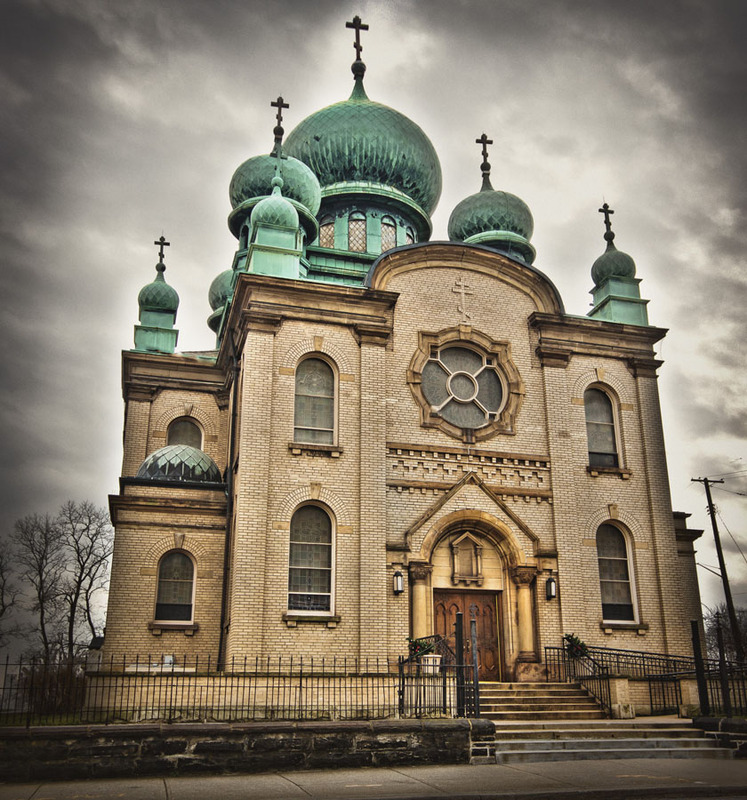 “The Old Stone Church, long a downtown Cleveland landmark, has a congregation dating back to 1820. Officially known as The First Presbyterian Society, it was founded at a time when Cleveland was just a village of a few hundred people. 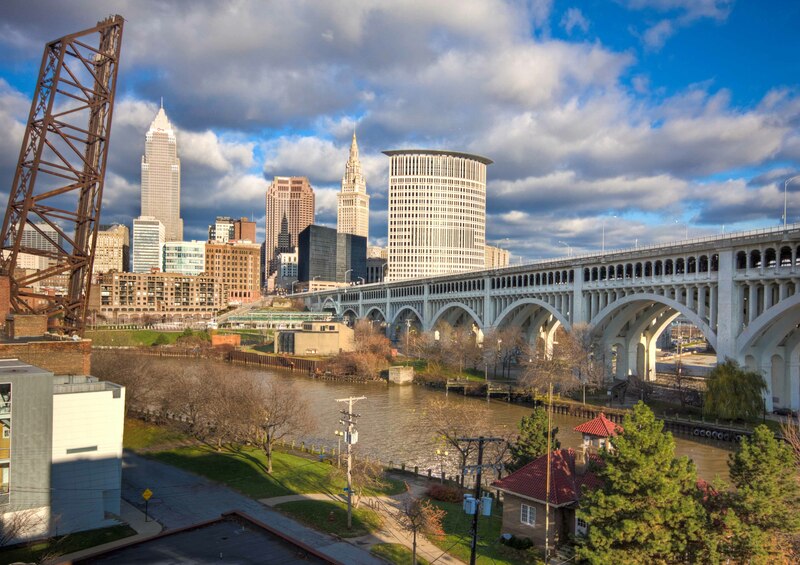 As Cleveland has grown in size and importance, The Old Stone Church has kept pace, becoming a symbol of spiritual leadership, community involvement and stability in the heart of the city. The sixteen Christian men and women who met on September 19, 1820, to sign the charter formally establishing the First Presbyterian Church were members of a Bible class which had met for a year under the direction of Elisha Taylor. Among them was Rebecca Carter who with her husband, Lorenzo, had been the first permanent white settlers in Cleveland. A variety of sites, including a one-room schoolhouse and the log courthouse, served as meeting places for the fledgling church. Finally, in 1827, The First Presbyterian Society was incorporated, with the primary purpose of building a permanent home for the congregation. The first church building was dedicated on February 26, 1834, on the northwest corner of Public Square, the historical center of downtown Cleveland. The building, of Tuscan-style architecture, was built of gray sandstone. It was the first stone church in Cleveland and was known as “The Stone Church.” Later, as the sandstone darkened, the name became The Old Stone Church. Dedicating the Church was the Rev. John Keep, the last of six home missionaries recruited by the Connecticut Missionary Service for “frontier service” to Congregational and Presbyterian groups. The year following the dedication, the first Pastor, Samuel Aiken, was called. He served more than 25 years, establishing a precedent for exceptionally long pastoral tenure throughout the history of The Old Stone Church. In 1853, reflecting the rapid growth of Cleveland, the congregation was outgrowing the sanctuary which had been erected just 20 years earlier. A new church, built on the site of the original structure, was dedicated on August 12, 1855. 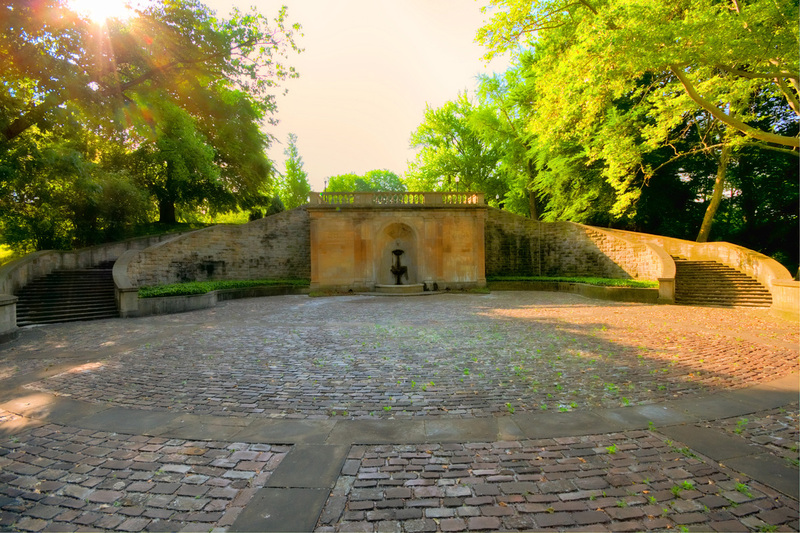 The massive foundation and walls were constructed of sandstone, lined with brick, at a cost of $60,000. Nineteen months later, on March 7, 1857, a disastrous fire hit The Old Stone Church and spread from the roof to the 250-ft. steeple, which swayed and crashed across Ontario Street. Amasa Stone led the successful struggle to rebuild on the original property, and the renovated church was dedicated on January 17, 1858. Later, galleries and another graceful spire were completed. During the following twenty-five years many social service organizations were formed by Old Stone members, directed toward moral and social problems. 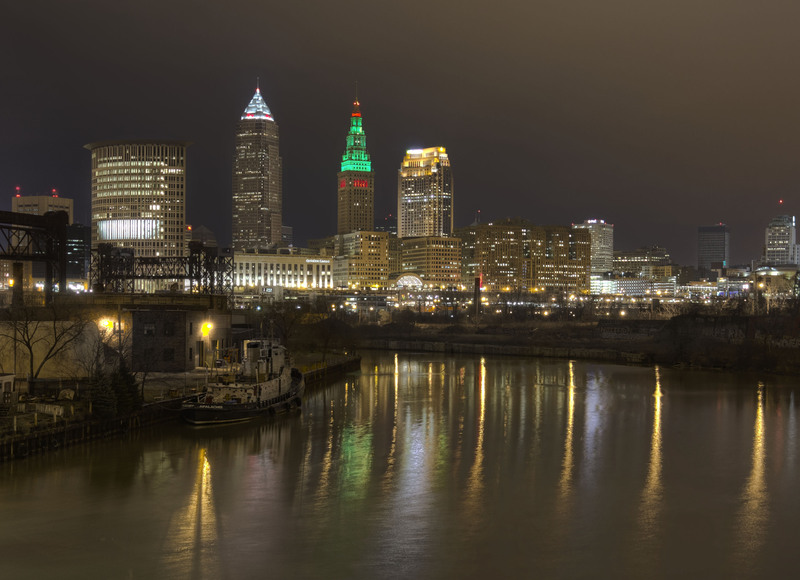 These included the YMCA, the YWCA, Children’s Aid Society, Western Seamen’s Society, Lakeside Hospital, The Goodrich Society, and the first Cleveland medical school. A Service of Thanksgiving was held at the end of the Civil War, and a new Peace Bell raised in the belfry. As Abraham Lincoln’s funeral cortege stopped at Public Square, people were called to his memorial service at the church by the tolling of the massive bell (now installed in front of the church, facing Public Square). Old Stone is the only remaining building to have been in existence during the lighting of Public Square with Charles Brush’s arc light in 1879. The building was struck by another severe fire on January 5, 1884. John Foote, Samuel E. Williamson and Col. John Hay convinced the congregation that the historic site was worth preserving. Work began immediately, with architect Charles Schweinfurth employed to guide the restoration. Mr. Schweinfurth was new to Cleveland and Old Stone’s renovation was the first of many important commercial architectural contributions he was to make to the city. While Old Stone’s walls required few repairs, the interior needed to be completely reconstructed. The steeple was declared unsafe and removed. 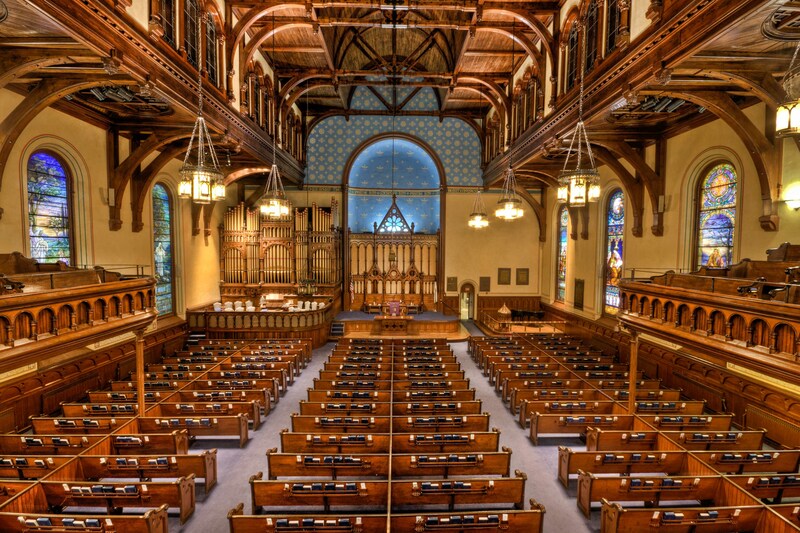 The restored church, dedicated on October 19, 1884, is essentially the church you see today. A recent capital campaign resulted in cleaning and repairing the church, re-landscaping, and restoring the steeple. The Sanctuary was also renovated”. This double barreled flintlock sporting gun was made by Jean Le Page for Napoleon Bonaparte, who in turn gave it to the Polish count, Vincent Corvin Graf von Krasine-Krasinski as a gift. Le Page was also the royal gun maker for the French king, Louis XVI. 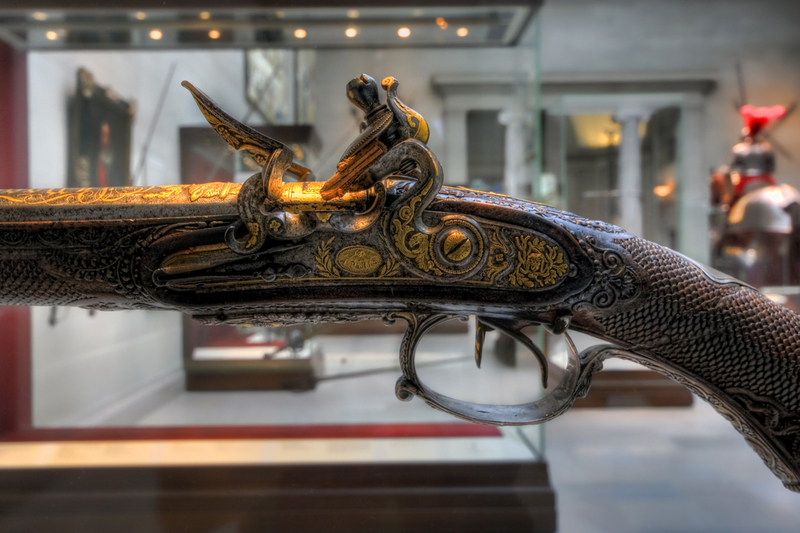 This amazing gun and many others can be viewed in the armored court section of the Cleveland Museum of Art. Given that this is my last blog post of the week I wanted to take this opportunity to wish all of you a very Merry Christmas and happy holiday season. This is one of my favorite photos of downtown at night so I thought I would share it with you.